Stephen Hawking is no doubt a brilliant man and an important scholar in the world of physics. In his new book, Hawking argues that there is no need of a God to explain the existence of the universe. You can read the article here. I appreciated the comments at the end of the article that Hawkings theory does not in fact disprove God. If all of those conditions were necessary for the universe to exist, I see the involvement of God as even more likely. At the risk of sounding rude, Hawkings theories also do not in fact disprove leprechauns. That doesn’t mean that, by default, leprechauns therefore exist. True, but the point is that Hawking was expressing his thoughts in a way to demonstrate that God was unnecessary. Hawking has not disproved God but that does not provide proof that God exists. I presented this link simply to show people what some are saying. 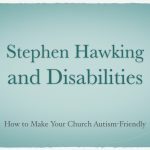 Mr. Hawking does nothing to negate a necessary being. Hawking no doubt will shift plenty of books, but certainly not for any great insight. The genius of Hawking is that he still manages to fool so many people.